Following last weekend's Premier League fixtures, the BBC Sport twitter account decided to share a fact with their followers. Sadly it was one of those flawed facts that assumes that top flight football has only existed for 20 years and everything before it just isn't relevant. Everything these days is referred to in terms of "the Premier League era", however the record for the worst start in top flight history was not set last week. 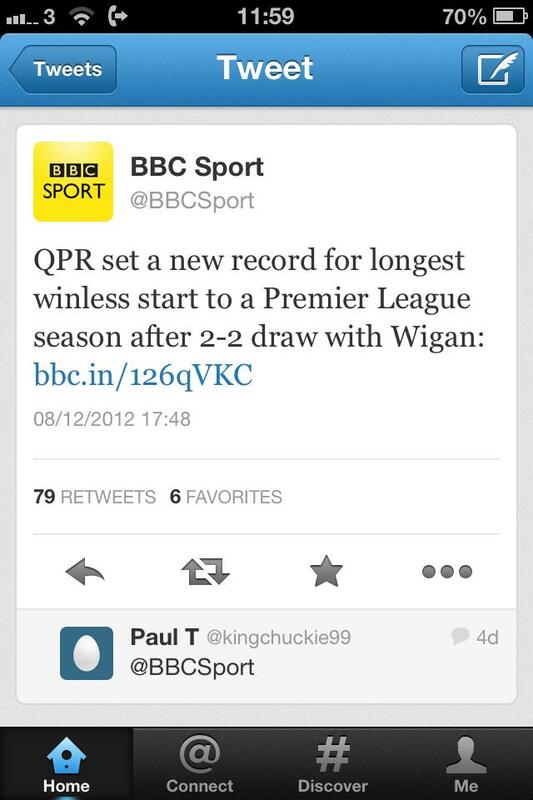 QPR equalled it. Not that the club involved would want that tag, but I guess a happy ending makes it more palatable. Just under two years before the Premier league kicked off, Sheffield United reached the 22nd December 1990 sitting bottom of Division 1 after 16 games and with just 4 points to their name. They were 8 points behind QPR , who sat one place higher and, given their awful goal difference, some 12 points from safety. The visitors to Bramall Lane that cold and misty afternoon were Nottingham Forest and the victory that followed kick-started United's season. Ian Bryson scored two and Brian Deane the other in a 3-2 win. Bryson coming close to what would have been his only career hat trick, as the ball hit both posts and came back out again. When United took the lead; Bryson became only the 4th player to score a league goal for United all season. However the joy was short lived as Forest scored from the re-start without a United player touching the ball. Future Blades player Franz Carr playing in Roy Keane for the equaliser. Keane then played Stuart Pearce in for Forest to take the lead and that first league victory seemed a distant dream. Then two brilliant crosses from the right wing and the boot of Carl Bradshaw, led to pinpoint headers first from Bryson and then from Deane. "It was a great relief to get our first win and the fans obviously felt the same, we felt we had been playing well but we just couldn't get the win. Once we won that game the confidence within the squad grew and we gradually moved up the table." The victory did have a positive effect, United winning 1-0 in their next game away at Luton Town, but it then took until late January for United to put any kind of form together. Through to the beginning of March they went on a run of 8 wins and a draw in 9 games. By season end they had won 13 games and eventually stayed up in 13th place. That was 12 points clear of the relegation places (only two teams went down) and 9 points clear of third bottom (ordinarily the last relegation place). Interestingly, QPR the team directly above them just before Christmas also survived finishing one place lower. Brian Deane also explained how United and manager Dave Basset fashioned that change in form. "It was an era where things were changing in football. Dave Bassett knew that he didn’t have a team that could compete technically with some of the better teams. We couldn’t afford some of the players that some of the other clubs had, they wouldn’t be attracted to come to Bramall Lane and play. But we found ways of equalising the situation by being a little bit more scientific in our approach to games." "I can’t say we were the first but we were certainly one of the first. If you look at what happened up to the point of us having four points just before Christmas; we actually introduced a new diet, we introduced new training methods, we had a fitness trainer (Ed Baranowski) come in twice a week and we became fitter and stronger than other teams. We scored more goals in the last ten minutes than other teams and they struggled to cope with us. In the end we survived because we adapted and changed and no one else had cottoned on to what we were doing. If they had been doing it, then the probability is that we would have struggled." "Although the league is different now, I don't think anyone will survive from that kind of position again." Yet I think this season could prove the exception to the rule; despite the fact QPR sit bottom on 7 points, some 8 points from safety. So why do I think they are the team that could achieve this and are there any similarities between now and 22 years ago. Whilst it is true that money has distorted football in recent years, you would have to say that QPR are in a position to turn this around. In fact they are financially stronger than many of the clubs they will be battling with in the fight for survival. United benefited from the fact that they had many teams around them that you would claim are beatable. The fact that they went on to beat Manchester United, Everton, Villa and Chelsea certainly helped their cause, but United must have felt that they stood a chance against the likes of Luton, Derby, Coventry and Sunderland. QPR could legitimately claim the same. On paper they have a squad that should at least be a match for many of the teams around them. The importance of starting a run of wins and the impact it can have is exemplified by Norwich, now 12th after 9 games without defeat. It strikes me that team spirit is something lacking in modern day football. maybe it has been "poisoned" by the money? After all it is rare you get a team coming up that don't sign a few established star names, often to the detriment of the overall team and the players who earned their promotion. Few of Dave Bassett's signings that season came from the top flight and for most it was the first taste of top flight football. You could even argue that his biggest signing, Vinnie Jones, caused as much disruption as positivity. Talking to the players of that time, there was a real "in this together" mentality, a closeness of team, club and fans that you only rarely see in football these days and certainly not in the Premier League. The nearest you can see to it now is perhaps Stoke, combining a team ethic with a stoic belief in what they are doing. There are few egos in that Stoke side, however there are plenty dotted throughout many of the other teams in the Premier League, including those in the bottom quartile and in particular at Loftus Road. Whilst, as Brian Deane explained, United benefited from innovative thinking in terms of preparation, training etc. it is hard to see where the Hoops can do anything revolutionary. However, they are in a position to do something different. A change of manager, should bring new ideas and whilst that might not necessarily translate into results straight away, there is potential for long term improvement. QPR have certainly not seen the immediate boost that "new manager syndrome" often provides, but it is hard not to believe that Harry Redknapp's influence and potentially changes of system and roles won't have an impact soon. There was a different expectation level placed on managers 20 years ago. Following back to back promotions, there was little clamour for changing the manager when the team were struggling to adapt at the top level. I think that managers would not get the benefit of such time these days, that has been shown at QPR, albeit on the back of one season of Premier League football already. I just hope that Southampton show the patience Nigel Adkins' hard work and success deserves, in similar circumstances to Dave Bassett 22 years ago. 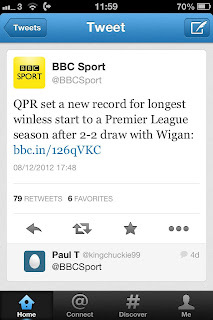 So can QPR survive? In some ways, and despite the huge changes in football since, I actually think that they are in a better place than United were. Redknapp has talked of not spending in January, although I will believe that when I see it, and that will certainly allow him to pep up a squad with his kind of players. A new broom and the capability to change the squad could be the difference. Saturday's game at home to Fulham is a great opportunity to kick start the survival push but, even if they fail to win and take United's unwanted record outright, I wouldn't bet against them staying up.